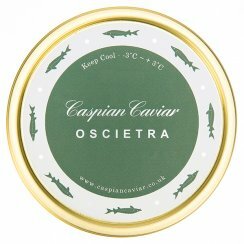 We like to think that our Oscietra caviar is one of the very best produced in Europe, with characteristic tobacco hues running through the eggs. If you like our Oscietra caviar, you will love our Royal Oscietra caviar. It is from the same farm but it is the pick of the caviar crop. The same great flavour lingering at the back of the palate but the Royal has the largest eggs of the crop.